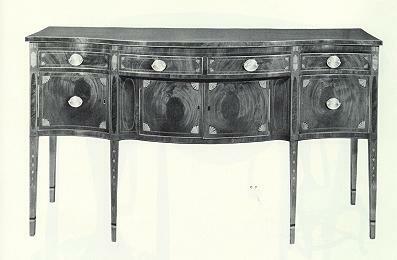 15 Very fine Hepplewhite inlaid mahogany serpentine front sideboard, the center with two divided drawers over recessed bowed cupboard of two doors, the concave ends each with a drawer and cupboard below, tapered legs with inlaid bellflowers supported by loop, the drawers and doors with fan inlaid quadrants. New York circa 1780-1800. Ex-collection Luke Vincent Lockwood. Illustrated Lockwood "Colonial Furniture in America" 1921, edition Volume I, figure 203. 73" long, 41" high, 26 1/2" deep. Photo Credit: American Antiques from Israel Sack Collection - Highland House Publishers Inc., Volume __, Plate 4775.